Choose 1 or more color combinations here. 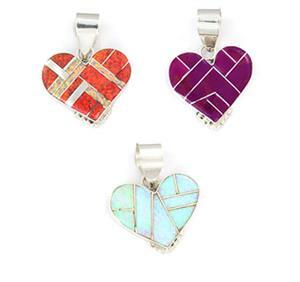 This sterling silver heart pendant is inlaid with assorted stones and has a beadwirde border only the bottom of the heart. It measures approximately 1 3/8" long including bail by 1" wide. Handmade by Navajo artisan Edison Yazzie. ***Now only available in purple spiny oyster. No other colors available at this time.